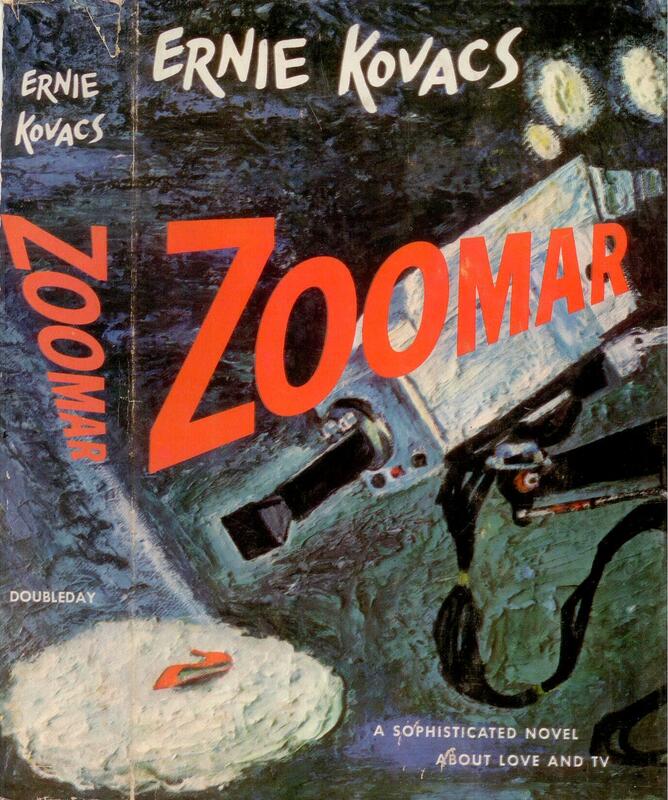 I recently read Ernie Kovac’s novel Zoomar. I’ve had a copy for years. The “modern popular novel” is generally not my cup of tea. 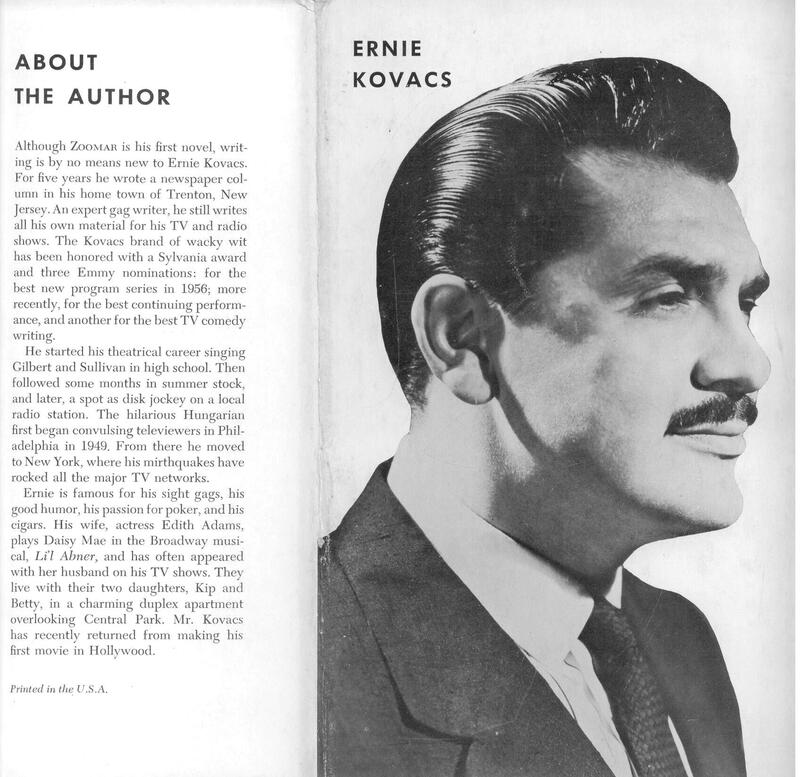 But Ernie Kovacs is an old hero and favorite of mine. Then, Zoomar was published over fifty years ago (in 1957) thus it’s not too modern. I found a second copy (with the dust jacket, as pictured). She also discounts Ernie’s claims to have written the book in thirteen days. His editor Kenneth McCormick thinks it was closer to two months. Either way, he still wrote it quite quickly. It’s interesting to look at the television industry of fifty years ago, and try to figure out how it compares to the industry today. Even then, he wrote that “We are the strongest, most influential medium in the entire world.” Even as a baby, TV was feeling its power grow. One section, late in the book, makes fun of television ads: “So get Invincible Spray today.” and so on. He goes on to talk about using orange crates for pedestals, and other improvisations. “How about Kovacs,” as asked. “I like him,” said Matti. There are also references to old movies and movie stars. If you know who Erich Von Stroheim and Eric Blore were, you’ll better appreciate one of his wisecracks. Others mention include Walt Disney, Phil Silvers, Sam Goldwyn, Ruby Keeler, Roy Rogers and (I think) Orson Welles. Other (non- movie) people mentioned include Goethe, Nietzsche, Lewis Carroll, Heinrich Heine, dancer Maria Tallchief and cartoonist Al Capp. There are some nice accounts of the Stork Club and of Christmas in New York. You get some sense of the city back in the 1950’s. He also describes the automobile phone (an ancestor of today’s “cell phone”). “She wouldn’t eat a poor defenseless bird,” Eileen said, with that misplaced faith that women have in men and animals. I appreciated this book for giving me more insights into Ernie Kovacs and his times. Of course, I prefer his television work. Yet reading this makes one wonder whether he’d have gone on writing books had he lived. If he had, I think he’d have done some interesting work. I’ve been doing further studies involving the great Mr. Kovacs. Expect another post on him from me next year. This entry was posted on December 15, 2010 at 11:29 pm and is filed under Uncategorized. You can follow any responses to this entry through the RSS 2.0 feed. You can leave a response, or trackback from your own site.